For the second year in a row Urban Sweetness was chosen to be a Finalist for this event. The Launch Test Kitchen is sponsered by the NAACP Cleveland, Cleveland Cavaliers, Aramark, ECDI Northern, and The Real Black Friday. 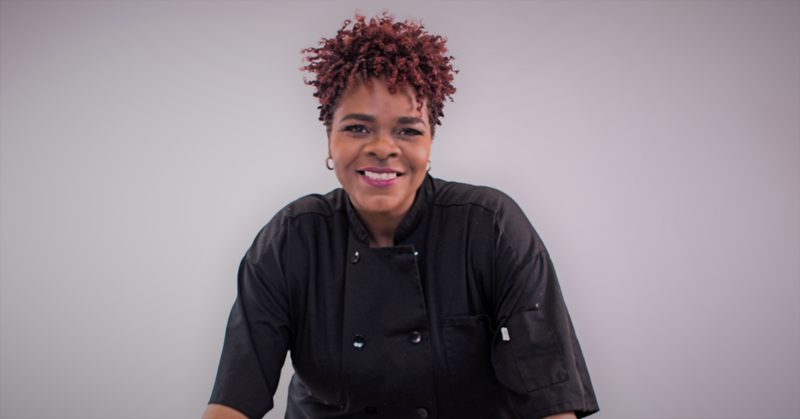 It is an opportunity for African-American Chefs, caterers, and restaurant owners to showcase their food at the Launch Test Kitchen in Quickens Loans Arena. It is a wonderful opportunity and again I had the pleasure of being a part of it again this year. Being the only vegan chef among eleven outstanding and talented chefs was not only an honor but also an eyeopening experience. Last year when I participated, I wasn’t sure what to expect and didn’t push as much as I should and it showed. I didn’t get a lot of “crowd” love, oh but this year, I made a vow to myself that I was going to show everybody there what Vegan Vicki, Urban Sweetness, and veganism was about. The way it works, each “taste tester” gets 3 stickers to put on your table. You are judge in presentation, creativity, and taste. I made our Signature MacTini’s, Pulled UnPork Sliders, and Cauliflower Wingz. I step up and boy did it make a difference. I shared my experiences and educated which is what I love to do, and those stickers started rolling in. I have to be honest, when I go more than the 2 stickers I got last year, I was already a winner. LOL Yes, I only got 2 stickers last year and I think they were sympathy stickers. LOL. There are four winners selected and my belief is that Aramark and the Cavs select the 3 winners to be the featured chefs from the panel of winners. I rejoiced because I got a lot of great feedback about my dishes. So here I am sitting at my desk at work and I get a voicemail message from the head of the NAACP Cleveland, basically telling me to call back because she has some great news for me. I didn’t know what to expect because it’s a week later and the “winners” had already been selected. When Danielle called back, she stated that Aramark had selected ME, Urban Sweetness to be a chef for the Launch Test Kitchen. To my surprise and confusion and many, many questions and high pitched screams, I couldn’t believe the news. I explained that I thought the four winners of the tasting were the ones Aramark would choose from, Danielle said “not necessarily”. All I could and can do now is praise God for the favor and the blessings He has and is pouring down on me. I am excited to see what will happen next. All glory belongs to God. So the moral of the story is, you don’t always have to be #1 to win. So come see me at the Q Arena in Section 126.